Warehouse workers and drivers walked out for a second day today over the new rules, which came into force on April 1. Jens Bekke, a spokesman for the world's fourth biggest brewer, said: "Previously, there has been free beer, water and soft drinks everywhere. "Yesterday, beers were removed from all refrigerators. The only place you can get a beer in future is in the canteen, at lunch." Mr Bekke said drivers retained an old right to have three beers per day outside lunch hours, and warehouse workers claimed the same right. He said: "Because of that, the warehouse staff went on strike yesterday, with other staff striking in sympathy." Bekke said as many as 800 had walked out on Wednesday, with 250 still on strike today. The Confederation of Danish Industry and trade union 3F have agreed to look into the dispute. 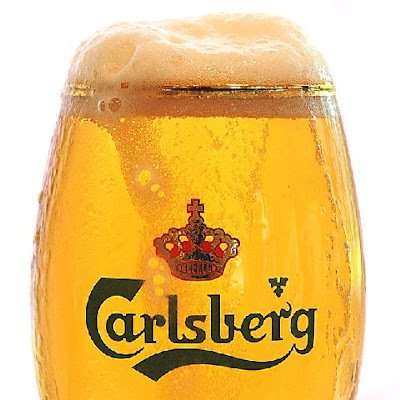 There have been no shipments from Copenhagen today, but Carlsberg is expecting the financial impact of the strike to be minor. Mr Bekke added that Carlsberg's trucks have alcohol locks so drivers would not be able to drink too much and drive. Sounds like they need someone with absolutely zero labour collective bargaining negotiation skills to come over and work with them. Free Beer with negotiations: Priceless. Didn't Sterling (former Evansville brewery) workers get free beer at one time? That must have been a policy for most breweries back in the day.